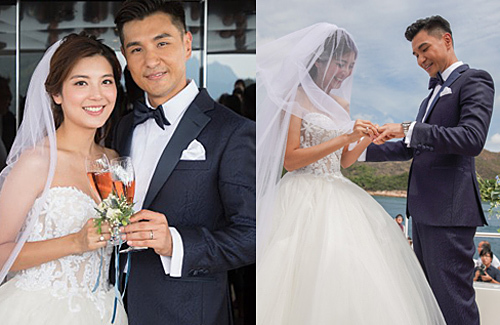 Amid blue skies and beautiful water views, 41-year-old Ruco Chan (陳展鵬) and 28-year-old Phoebe Sin (單文柔) got married on a yacht on October 13. 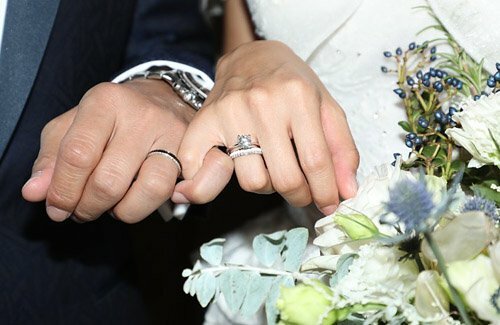 Holding back tears during his wedding vows, Ruco said, “I promise that I’ll be loyal to you in my lifetime.” An evening banquet followed at the Four Seasons Hotel, where Ruco serenaded his bride and caused her to cry happily. 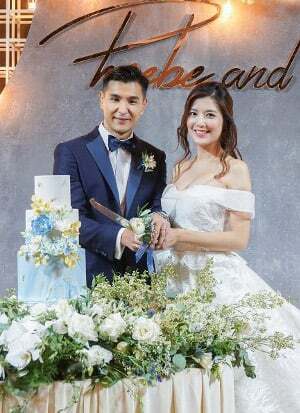 Although splurging approximately a million dollars (HKD) on their wedding today, the couple will follow up with a larger party in a few days to include more of their entertainment industry friends. At 7 a.m., Ruco arrived at the Four Seasons Hotel in Hong Kong to receive the bride. Smiling at reporters, the 41-year-old actor said he had a good night’s sleep and didn’t feel especially nervous. Since Phoebe promised to spare Ruco from bridesmaids’ door games, the couple emerged from the hotel promptly one hour later. Phoebe looked stunning in a red qipao and embroidered high heels, while Ruco wore a black suit with a dragon design. The couple followed the Chinese tradition in which a red umbrella was held over the bride’s head to protect her from evil spirits as they boarded the car, while accompanied by groomsmen, former ATV actors Derek To (杜挺豪) and Jerry Leung (梁浩楷); and Phoebe’s good friends, Tiffany Lau (劉穎鏇) and Joyce Ngai (魏韵芝). 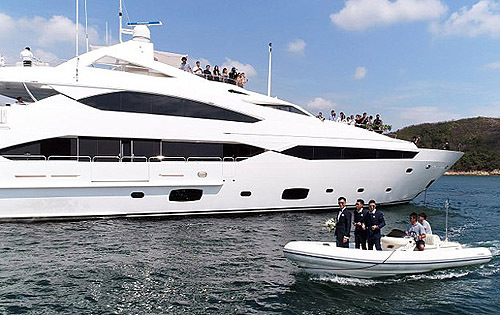 Like a scene out of a movie, Ruco arrived on a speedboat before boarding the yacht for the wedding ceremony. The couple exchanged their vows under the witness of 50 guests. 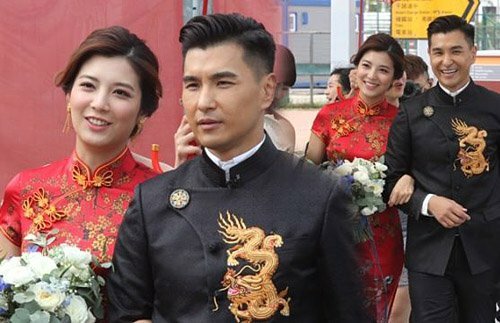 Hoping to say his vows perfectly without forgetting any words, Ruco glanced at note cards as he said nervously, “I invited everyone here to witness I, Ruco Chan, making Phoebe Sin my legal wife. From the start when we first met to becoming partners, we were not only friends and lovers, you give me happiness and satisfaction when I laugh. When I cry, you will quietly stand by my side and shield me from the wind and rain. Now I finally understand when two people come together, it’s not 1+1=2, but rather it’s 0.5+0.5=1. [Marriage] requires compromise. I promise you that I’ll be loyal to you in my lifetime.” Ruco’s eyes were already wet with tears by the time he finished his vows. Hoping to give his bride an unforgettable wedding in peaceful surroundings, it was Ruco’s idea to have their wedding ceremony on a yacht. “I really did have an unforgettable time, since we had to consider many problems that could happen on a yacht,” Phoebe laughed while speaking with the press at the Four Seasons Hotel later that evening. Aside from the tight timing and worrying about rain, the couple had to consider if any guests would get sea sick and even selected their dock location based on wind direction. But Ruco is a very good planner and tackled these issues one by one. Although the banquet was intimate in size, Ruco invited many of former ATV stars which he had deep friendships with, such as Alice Chan (陳煒), Elena Kong (江美儀), Andrew Yuen (袁文傑), Nina Paw (鮑起靜). Yvonne Lam (林漪娸) and Lau Dan (劉丹等) also attended. Ruco’s parents are very happy to see him get married. He said, “Especially my father. Normally he’s very cool and doesn’t say much, but I can tell he’s very happy today. He looked a little shy when he looked at his daughter-in-law and smiled.” Ruco’s mother, who had a stroke earlier, asked Phoebe to take good care of Ruco. After their wedding, the couple will not immediately go on their honeymoon since they have already traveled to London and Paris in September. Ruco will also start filming a new drama in December. While the couple wants children, they are not in a rush and will let conception happen naturally. For extensive photos of Ruco and Phoebe’s wedding day, CLICK HERE. Congratulations to the happy couple, both looked good. Phoebe was gorgeous in the stunning red qipao. @dramafan Agree. Love the simple hair and makeup, too. Congrats! I love the looks they are giving to each other. Very radiant. Phoebe does have nice legs. Both are looking great! Congrats to Ruco and Phoebe! Very happy for them! They looked beautiful on their wedding day, especially their wedding ceremony on the yacht. Aww.. congratulations!!! They’re both looking good but not sure if someone getting ready for the wedding this early in the morning? Really like this speedboat/yacht wedding plan. Good thinking! I had commented earlier in the day before I saw the updates. Just wanted to add that I loved how emotional Phoebe got when Ruco sang to her. I am a sap for lovely weddings and they looked so sweet and happy. @potatochip when Phoebe got up the stage, one can see how happy she is…it is really lovely to have groom serenade the bride.